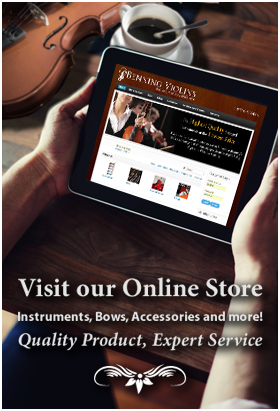 A good violin, viola or cello varnish can play an important role in perfecting the sound quality of an instrument. The varnish applied by Stradivari to his violins is still believed by many to be the secret the their phenomenal sound. Whether oil or alcohol-based, violinmakers prize their varnish recipes as one of the most important elements of the violinmaking process. Before applying any coatings to the instrument, the white wood can be given a tan by exposure to sunlight for a period of several days to several weeks. Aging the wood brings out the color and visual character of the wood through oxidation and ultraviolet light. When the wood has received the desired look, the next stage is applying a “ground” coating. 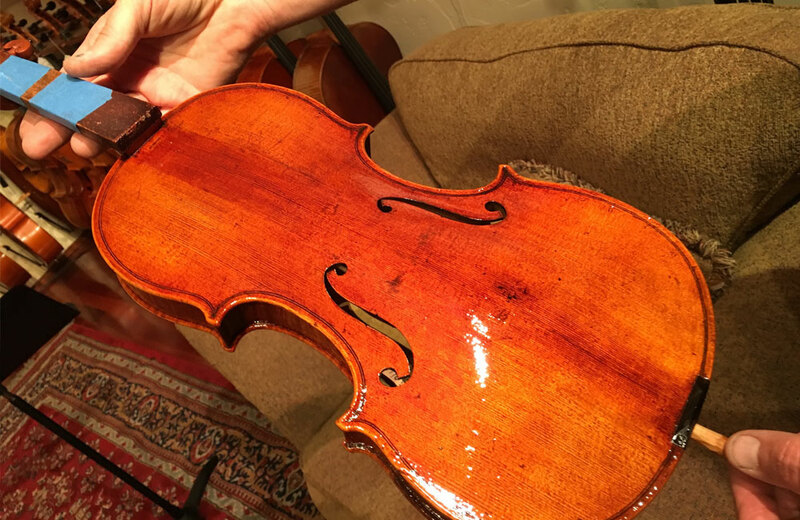 A violinmaker may prefer to apply a primer or sealer first. While also darkening and deepening the wood’s visual depth, the ground coating strengthens and protects the instrument even after the varnish has worn off. Many recipes for the ground coat exist and typically this is a tightly held secret. Next, the instrument is ready to be varnished. Many recipes exist; most consist of sun-thickened oils such as linseed, lavender or walnut oil combined with oxidized resins such as amber, dammar, balsam and shellac. Alcohol can also be used as a part of or in addition to an oil base. The mixture is left to sit for up to a week, being stirred a few times a day until the lac no longer sits at the top. The mixture is then boiled, cooled and boiled again, then filtered for impurities. Adding color to the varnish mixture can help to bring out darker, richer tones, if the varnish mixture is too light. Coloring agents, or “lakes,” include turmeric and saffron for a yellow tone. Sandalwood and pernambucco bring out a redder tone. The varnish is then applied in many coats depending upon the thickness and consistency of the varnish. The varnish is allowed to dry in the sun between coats. Touch ups can be added if there are areas needing additional coating. The instrument can then be lightly polished using a soft cloth with alcohol and mineral oil and or polished out using pumice powders.